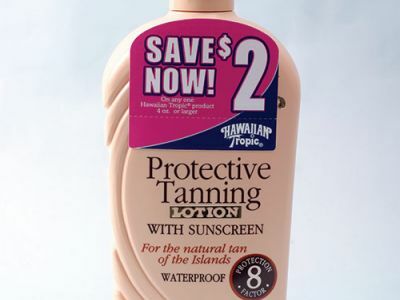 Hawaiian Tropic wanted to attach instant redeemable coupons (IRCs) to packaging for its line of sunscreen in order to draw attention to new product launches and promotions. But it needed coupons it could apply more quickly and easily to the curved bottles. Drawing from its experience printing on plastic, Do-It solved the problem with six PrinTab printed hang tabs in different shapes and sizes. The tear-off coupons were designed to be simple enough to work with Hawaiian Tropic’s automatic application system and be unobtrusive on their packaging, yet large enough to contain a printed, scanable bar code. Hawaiian Tropic’s application equipment, and allowed the IRCs to adhere more securely. In addition, Do-It printed the IRCs using its UV Flexo printing process, giving the coupons bolder, deeper, richer printing that makes them stand out against the product package. The perforated IRCs allow the store clerk to simply tear off the top portion and scan the bar code on the back to deduct the coupon’s value from the purchase price. The imprinted bar code allows Hawaiian Tropic to better track its sales.